In late January, while all trade policy eyes were turned on the NAFTA talks, Canadian trade negotiators were closeted away in Japan with the other ten remaining Trans-Pacific Partnership (TPP) countries in order to salvage that agreement. President Donald Trump had pulled the U.S. out of the deeply unpopular TPP exactly a year earlier, which appeared to land a death blow to a treaty condemned across the U.S. political spectrum as entrenching corporate power at public expense. The “new” agreement, embarrassingly renamed the Comprehensive and Progressive Trade-Pacific Partnership Agreement (CPTPP) at Canada’s request, was signed in Chile on March 8. Though widely reported as a rebuke to the Trump administration, the recycled CPTPP, despite its Orwellian title, could also spell the demise of the Trudeau government’s much-hyped progressive trade agenda. Although a few details remain secret, the final agreement is little changed from an earlier version rebuffed by Canada. According to the Canadian government’s backgrounder, Canada signed side letters with all other CPTPP members that purportedly enhance Canada’s flexibility to protect culture. The original TPP contained the weakest protections for cultural diversity of any modern Canadian FTA. It made no reference to the 2005 UNESCO cultural instrument (even though seven CPTPP countries including Canada are parties); contained chapter-specific exclusions for cultural industries, rather than a blanket general exception; and explicitly restricted Canada’s authority to ensure that on-line providers, who are currently exempt, contribute in future to supporting Canadian content. The new side letters can only supplement or clarify the basic text, they don’t solve any of these problems. Canada claims it received “important commitments” in a side letter with Japan, ensuring Japanese automotive standards do not unduly impede imports. Canada is also claiming “important commitments” were received from Malaysia regarding auto rules of origin (ROO), though it is unclear how this letter differs, if at all, from a previously published Canada-Malaysia side letter on motor vehicles. The underlying issue—that the looser ROO will expose Canada to intensified competition from Japanese vehicles with much higher levels of content from non-CPTPP members such as China, Thailand and Indonesia—was not addressed. Canada’s commitment to phase out its auto tariffs over a short period of five years is also unchanged. Meanwhile, with the U.S. out, no Canadian-assembled vehicles would qualify for preferential tariff treatment under the CPTPP ROO, which requires 45 per cent regional content for vehicles (and 35 to 45 per cent for most parts). While the CPTPP may have a new name, it is largely the same old agreement signed in February 2016. Japan insisted that the text not be amended, presumably for fear of unravelling the whole thing. As a result, almost all of the original 29-chapter, over 5,000-page text is preserved. A new protocol has been added that spells out the terms of accession, and the CPTPP will come into effect after it has been ratified by six members. The main change is that twenty provisions of the original pact, backed chiefly by the U.S., have been suspended. Eleven of these suspended commitments are in the Intellectual Property (IP) chapter. They include some of the most aggressive U.S. IP demands, such as extended patent terms for medicines and 70-year (+life of the author) copyright terms. Also gone are the minimum terms of data protection for biologics and requirements to allow patents for new uses of existing products (evergreening), patenting of inventions derived from plants, and patenting of processes such as surgical methods. The removal of these regressive provisions is a significant victory for critics of the original TPP chapter and will alleviate its worst feared impacts on access to affordable medicines. Hypothetically, these suspended provisions could come into effect if a new U.S. administration were to rejoin the pact. But this step would require the consensus of all members, making these provisions just dead letters unless everyone agrees otherwise. Even the rosiest economic projections of the CPTPP come up with only tiny economic gains: for example, a 0.082 per cent increase in Canadian GDP by 2035. This represents a one-time increase after 15 years, not an annual increase. These models, like all computable general equilibrium (CGE) models, also make unrealistic assumptions that include full employment. Yet even these models concur that Canada’s overall trade balance with the Asia Pacific Rim will worsen, while the biggest projected export gains will be concentrated in resource-based or agricultural export industries (e.g. beef). Dairy farmers were angered to learn that the market access concessions (3.25 per cent of the Canadian market) made by the Harper government to the U.S. will be shared out among the remaining TPP members, rather than scaled back to reflect the U.S. exit. Meanwhile, the trade position of most higher-value-added Canadian manufacturing industries will deteriorate. These uneven impacts, and at best tiny overall gains, must be measured against the harder-to-quantify, but clearly negative impacts of many CPTPP provisions on public policy. One of the worst features of the treaty is its unreformed investor-state dispute settlement (ISDS) mechanism. Except for one change, which suspended a U.S.-backed provision that would have allowed investors to enforce the terms of “investment agreements” and “investment authorizations” through arbitration, old-style ISDS remains fully in force. The Trudeau government gave up on any attempt to include its “reformed” CETA-style Investment Court System. This failure undermines Canada’s negotiating position both in the NAFTA talks and in efforts to advance a new multilateral investment court. With the coverage of investors from Japan and Oceania, fully 90% of inward foreign investment in Canada could soon be subject to ISDS, which can only worsen our status as one of the most sued developed countries in the world. Similar to ineffective labour chapters in previous agreements, the CPTPP obliges a complainant to prove both that a member country has not enforced its own labour laws and that this violation has had an impact on trade. In practice, this burden of proof is so difficult to meet that there has never been a single successful labour complaint, let alone sanctions, under the labour chapter of any FTA. The CPTPP will prove ineffective in addressing the serious, systematic labour and human rights violations that occur in Mexico, Vietnam and some other member countries. 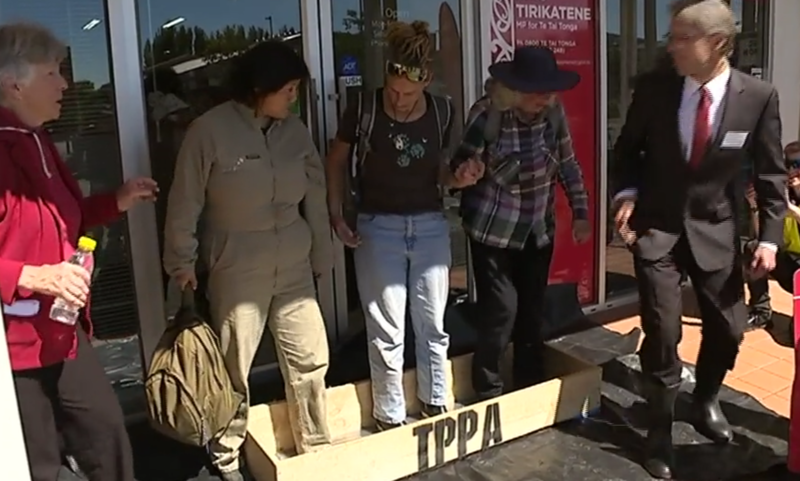 If anything, under the CPTPP these inadequate labour protections have been weakened. Vietnam has delayed commitments made to the U.S. to strengthen its national labour protections, and a rule allowing government purchases to be conditional on respect for labour rights has been suspended. By turning a blind eye on labour protections, Canada has completely undermined its proposals for effective labour rights in the NAFTA 2.0 and future trade agreements. Other elements of the Trudeau government’s self-styled progressive trade agenda — including gender equity and Indigenous rights—are nowhere to be found in the CPTPP. Meanwhile, the environmental chapter contains only the same, mostly toothless, protections found in the original TPP. The Canadian government claims it achieved some (still secret) wording in a new preamble that aligns with its progressive aspirations. But a treaty’s preamble is at best a guide to interpretation; it does not change, let alone override, the obligations in the text of the treaty. Some might argue that the Canadian government had little choice: it could sign the unmodified agreement or be left behind. The Canadian big business lobby, except for the Detroit three automakers, was firmly behind the deal. But there is always a choice. With or without the CPTPP, trade with the Pacific Rim (which represents less than 5 per cent of Canadian global exports, much of which is already tariff-free) would continue. Looking back, the whole robotic exercise of resuscitating the TPP, rather than starting fresh and working towards a reset of global trade and investment rules, may prove to be an historic blunder. If the Trudeau government’s rhetoric about progressive trade and inclusive growth means anything—which is an open question—then it requires a genuine rebalancing of trade treaties to better protect workers, citizens and the environment, and to confront the 21st century challenges of extreme inequality and runaway climate change. CCPA Senior Research Fellow Scott Sinclair directs the centre’s Trade and Investment Research Project. • Is progressive free trade a pipe dream? Those progressive clauses are falling flat everywhere but Europe. China snubbed is. Mexico is not interested. It appears they are ideas ahead of 5hier time and need to be dropped if we want real deals to replace NAFTA. Signup to CCPA’s e-newsletter to get our latest reports and analysis delivered to your inbox. Sign up to CCPA's e-newsletter to get our latest reports and analysis delivered to your inbox.